1 Whisk the cream in an electric mixer until the butter separates completely from the buttermilk. This should take 10-12 minutes on medium speed. 2 Line a bowl with a large piece of muslin or cheesecloth. 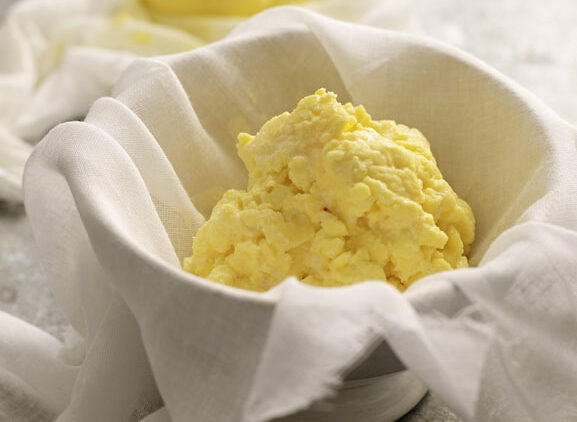 Put the butter into the cloth, wrap the cloth around it, and squeeze over the bowl until the buttermilk that comes out runs clear. 3 Add the butter back to the machine and whisk in the salt. Now either pack the butter into an airtight container for storage in the fridge (it will keep for up to a week), or have some fun with butter presses, which can be found on the internet. If you want the butter to spread easily, don’t squeeze out too much of the milk in step 2. I don’t waste the buttermilk – I keep it in the fridge and use it for cereals in the morning (it has a unique flavour).